Editors get very passionate about books they work on – the Editor’s Desk series is his or her place to write in-depth about what makes a certain title special. Get the real inside-scoop on how books are shaped by the people who know them best. A few summers ago, Juan Gabriel Vásquez’s novel The Sound of Things Falling had just taken the literary world by storm. Bestselling, universally praised, hailed as “brilliant” on the cover of the New York Times Book review by Edmund White, the novel was a huge moment for Juan. Riverhead had published two earlier critically acclaimed novels of his as well: The Informers and The Secret History of Costaguana. He happened to be in New York, visiting from Bogota, Colombia, for the Brooklyn Book Festival where he wowed crowds with his mellifluous voice. I met up with Juan and his wife, Mariana, before his Festival events and we had a bagel brunch on the roof of my apartment building in Brooklyn – a quintessential borough activity. 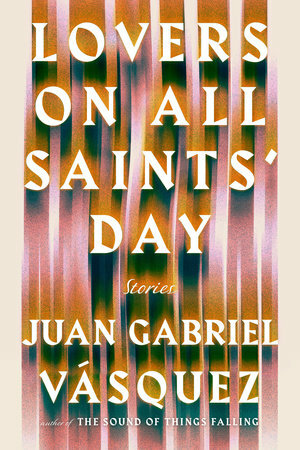 As we talked about future books by Juan, he mentioned an earlier book of his – Los Amantes de Todos los Santos (which we’ve translated as Lovers on All Saints’ Day) – a collection of stories that he had always felt was some of his best writing. And it had never been translated into English, not one story. I remembered his translator, the inimitable Anne McLean, confiding in me that the stories had always been some of her favorite writing of Juan’s too. I got jealous: they all loved this book and I had never read it! We hatched a plan then and there to bring this book out to American readers, to get it translated into English for the first time. One of the wonderful things about this story collection is how different it is from Juan’s novels. It takes place in Europe – mostly in France and Belgium – which had for many years been the place where Juan lived as an ex-pat, far from Colombia and South America. The influence of European writers, of a moody, earthy, ancient perspective, resounds through these stories. Juan references the idea that a story collection is like a novel where none of the characters know each other. They exist in a universe, struggling, loving, making grave mistakes and small triumphs, and at the end of this crescendo of a collection, you come away with an overwhelming sense of loss and love, of humanity at its most burdened and brilliant. This collection showcases the breadth of Juan’s ability; he is truly one of the great writers of our time, in any language, and I’m proud to bring all of his writing to American readers – past, present, and future. Learn more about Lovers on All Saints’ Day here.